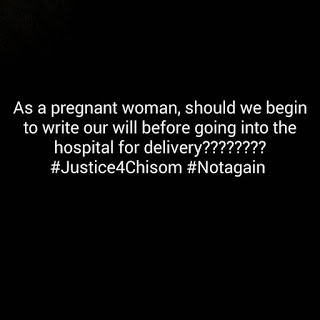 Home Sponsored #Justiceforchisom: As a pregnant woman in Nigeria should we begin to write our will before going into the hospital for delivery??? #Justiceforchisom: As a pregnant woman in Nigeria should we begin to write our will before going into the hospital for delivery??? Justiceforchisom: The family of late Chisom Jane Anekwe (nee Okereke) and LEAP Africa Alumni are demanding for justice following her painful death at the Magodo Specialist Hospital. The young mother of two daughters died on April 30th, 2017, while giving birth to her third child, a boy after a prolonged labour. Sadly, the baby also died. According to her family members and friends, Chisom was abandoned and left unattended to deal with labour pains and other pregnancy complications. she was laid to rest in Awka, Anambra State today, May 16. As a pregnant woman in Nigeria, should we begin to write our will when it is time to go in for delivery in Nigeria ???? On the #Justiceforchisomcase . First of all there are some very important information one should know when going into labour. If only the husband knew waiting for some unavailable doctors while the wife was in labour could cost both mother and child lives he would have rushed her out of the death palace hospital she was in wayyyy earlier. So many things went wrong in their story and they are so avoidable. Funny, how people desperately avoid Government hospitals in the hope of getting better care in private hospitals and still get murdered there. It's either it is unavailability of health practitioner, then it is unavailability of equipment and consumables most especially blood. when all these are available then we face negligence and carelessness issues. I know of a country where if any woman dies during delivery the doctor have to personally report himself to the health minister and investigation will be carried out on account of the report. Nigeria should start that too inculcate the spirit of accountability in doctors mind. Funny not that Government hospitals are any better, you go there and wait for gazillion hours before you are attended to and by the time it gets to your turn health practitioner is tired and starts making silly mistakes. I remember the last time I was in one general hospital after waiting for more than 4hrs fo the nurse to record my test result history in my file note. And right there with my test result in her hand she recorded my blood group wrongly. And when I asked to see what she has written she gave attitude, she allowed me check after insisting and I saw the huge life threatening mistake she just made in my file. I told her right there that she just killed another woman. In case of emergency thatz the blood they will give me and am dead like that and everyone will just shove it off as one more death. I made her realize her mistake and threatened to report her negligence but after she apologized profusely I let it go. See where the negligence started from? Then I started Wondering who to blame? This same lady has been on her feet for more than four hours doing thesame thing and has attended to more than 50 people before me , for lack of staffs and improper management, fatigue will surely have set in. I started Wondering how many errors like that has she done while taking patient history that might one day cost life? So many little details are involved in taking delivery. It's a very delicate step but once you are knowledgeable you keep the practitioners on their feet and save yourself just a little bit. Am sure so many other factors was in play on Chisom death that we don't know about. I just hope proper investigation and justice is eventually served. We have so many cases like this in court being dragged out unnecessarily. My heart is heavy. Oh no.....am not blaming the husband am just making a point which is for every woman and man going into the hospital for delivery to be harmed with so much knowledge going in. That way your life is in your hands and God's own not just the doctors or the surgeons. "Read about signs labour, read on signs of stressed labour, read on when to opt for CS, read! read! You find out so much you know when they are making a wrong move or acting negligent. Finally the only way not to die from pregnancy is not to get pregnant at all, lets endeavour to also spread the gospel of Family planning. It saves lives. God help Nigeria!!!! We are tired of needless maternal death. Help!!! !